State feminism is feminism created or approved by the government of a state or nation. It usually specifies a particular program. 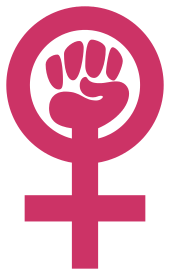 The government may, at the same time, prohibit non-governmental organizations from advocating for any other feminist program. In the 20th century, Turkey's government "preempted feminism". The Turkish national government's program in the 1920s included mandatory de-hijabicization (unveiling of women), access for women to more education and work, and political rights for women, all as part of a national effort to emulate some Western cultural characteristics in a Muslim nation. In the 1980s, second-wave feminism appeared, among daughters of leading women of Turkey's Kemalist movement, the women being feminist within the government's definition and leadership. The state feminism they followed, according to scholar Margot Badran, covered parts of patriarchy with an appearance of Western progressivity. In South Yemen, also known as the People's Democratic Republic of Yemen (with the subsequent unification of two Yemens into one, the former PDRY is now generally south Yemen), state feminism had little effect on patriarchy and did not have much influence beyond Aden, a port city in the PDRY. "Women in the south ... seemed to believe their gains would never be rescinded. They behaved as feminists, if by that is meant shaping lives of their choice by accessing the new options offered them. But they did not embrace a feminist ideology or identity, as this was preempted by the state. When the socialist regime collapsed, the fragile gains of state feminism went with it." "Northern women had acquired an acute gender consciousness and developed practical feminist skills ... but they had no legitimate political space. Southern women had been able to exploit the educational and professional benefits conferred under state feminism, but they did not have the independent ideological space in which to develop a feminism of their own." Post-unification Yemen has been analyzed by one author. In the 1980s and 1990s, "feminist activists and scholars in the Middle East assailed the limits of 'state feminism' and exposed its patriarchal dimensions." "Sharon Wesoky characterized the relationship of an emergent women's movement to the [Chinese] state as 'symbiotic,' containing elements of both autonomy and dependence, and operating largely within rather than in opposition to party-state institutions." "'State feminisms' have been discredited elsewhere as well [e.g., in China] following the collapse of communist and socialist regimes." "Many feminists ... consider the notion of a state feminism to be an oxymoron." Independent women's movements may be prohibited by the government. Badran, Margot (2009). Feminism in Islam: Secular and Religious Convergences. Oxford, UK: Oneworld. ISBN 978-1-85168-556-1. Carapico, Sheila (1991). "Women and public participation in Yemen". Middle East Report. 21 (173): 15. Hershatter, Gail (2007). Women and Revolution in China. Berkeley, CA: University of California Press. Yang, Mayfair Mei-Hui (1998). "From gender erasure to gender difference: state feminism, consumer sexuality, and women's public sphere in China". In Mayfair Mei-Hui Yang. Spaces of their Own: Women's Public Sphere in Transnational China. Public Worlds. 4. Minneapolis, MN: University of Minnesota Press. pp. 35–67. ISBN 9780816631469. This article is issued from Wikipedia - version of the 5/9/2016. The text is available under the Creative Commons Attribution/Share Alike but additional terms may apply for the media files.